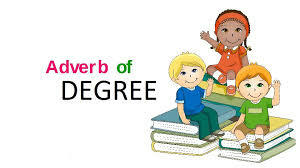 Adverb of degree adalah adverb (keterangan) yang digunakan untuk menyatakan sampai seberapa jauh (tingkatan atau derajat) suatu kegiatan atau peristiwa. Menerangkan verb sebelum main V completely, nearly, strongly He strongly recommended the book. diantara auxilliary V dan main V entirely, positively, totally I will totally support you. setelah main V a lot, greatly, strongly My brother eats a lot. Menerangkan adjective sebelum adjective extremely, really, very The weather is very cold. sebelum & sesudah adj. so…that, too…to She is so generous that the poors love her. sesudah adjective enough The juice is sweet enough. Menerangkan adverb sebelum adverb extremelly, so, too She was swimming so beautifully at this time yesterday. sebelum & sesudah adv. so…that, too…to The student studied too hard to pass the test. sesudah adverb enough He drives slowly enough. Menerangkan verb seberapa banyak sangat … sekali absolutely, fully, highly I absolutely agree with your opinion. sangat moderately, really, trully A mother is a person who really loves you. kurang barely, hardly She barely plays basketball before. seberapa complete keseluruhan completely, entirely, totally Your parents will totally support your goal. sebagian almost, partly, somewhat The task is almost finished. (hampir) tidak barely, hardly He barely helps his mother. Menerangkan adjective seberapa banyak sangat … sekali /berlebihan awfully, extremely, too The student is extremely dilligent. sangat rather, really, so The man is rather unfaithful. sedang moderately, somewhat She is moderately stressful. kurang fairly, hardly His room is hardly clean. seberapa complete keseluruhan completely, practically Your design is practically perfect. sebagian partially, somewhat My project is partially complete. (hampir) tidak barely, hardly Your hypothesis was hardly acceptable. Menerangkan adverb seberapa banyak berlebihan excessively, too He works too hard. sangat extremely, really, so The fat woman walks extremely slowly. sedang relatively, somewhat The defendant spoke relatively honestly. kurang fairly, slightly The boy learned math fairly quickly.